The mission of the International Wildlife Refuge Alliance is to support the first international wildlife refuge in North America. We work with partnerships to protect, conserve, and manage the Refuge’s wildlife and habitats; to create exceptional conservation, recreational, and educational experiences; and to develop the next generation of conservation stewards. Members of the Board come from a wide range of organizations, businesses and backgrounds to contribute their skills to the success of the Refuge. A day of celebration with past Congressman John D. Dingell & Congresswoman Debbie Dingell, January 14, 2017. 2017 marked the 35th year of Detroit River Hawk Watch (DRHW). Led by the Primary Hawk Counter, citizen scientists monitor the annual migration of raptors during their long journey to their wintering grounds in the southern United States and Mexico. DRHW is a partnership among the U.S. 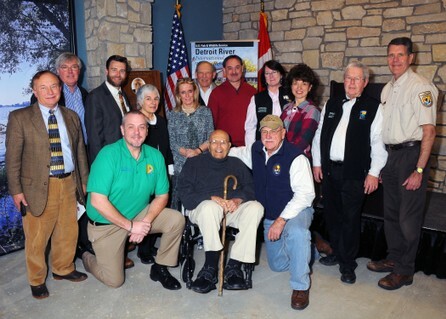 Fish & Wildlife Service, the IWRA, Huron Clinton Metroparks, and the DRHW Advisory Committee. For more information about DRHW's 35 years of monitoring, click here. To help support the efforts of DRHW and the Primary Hawk Counter, click on the Donate button below. The Nature Store Fund enables the IWRA to research and purchase a wide variety of educational items for sale in the Visitor Center's new store. Help us be fully stocked when the Center opens! The Blue Goose Bus Fund offers an allowance for school groups to offset the cost of bus transportation to the Refuge. For more information, visit our "What's New" page. It is our priority to consistently provide a quality conservation and outdoor recreational experience at the Refuge Gateway and Humbug Marsh Unit and the endowment will manifest our commitment to making this a priority. Considerable funds are needed to operate, maintain, and program the Visitor Center, boat dock and Fishing Pier, trails, environmental education shelter, etc. with quality. This endowment also helps protect our initial investment (land acquisition, restoration work, the Visitor Center building) and ensures a long-term mechanism to operate, maintain, and program these facilities and habitats with quality. In addition, the endowment will help operate, maintain, and program other units of the Refuge. Please help by donating through PayPal. Be sure to note how you want your donation to be applied.